Ukraine Crisis: Has Obama Got Any Red Line This Time Around? Why Punishing Putin Is Testing Obama! BBC Mark Mardell Tells It All And More. President Obama has ordered measures designed to hurt the Russian economy and isolate the country. US officials say Vladimir Putin has made a terrible choice, which will leave his country in a much weaker position. But this is a critical test of Obama's leadership too, one that will demonstrate how much clout the US has in the world. Secretary of State John Kerry is flying to Kiev to meet leaders there, and the US is trying to co-ordinate an international response to put pressure on President Putin. But senior administration officials have pretty much ruled out military intervention. President Obama's critics are accusing him of acting too slowly and, once again, allowing someone to trample all over his "red lines". On Friday evening he warned that there would be "costs" to Russian military intervention in Ukraine. Hours later the troops moved in. 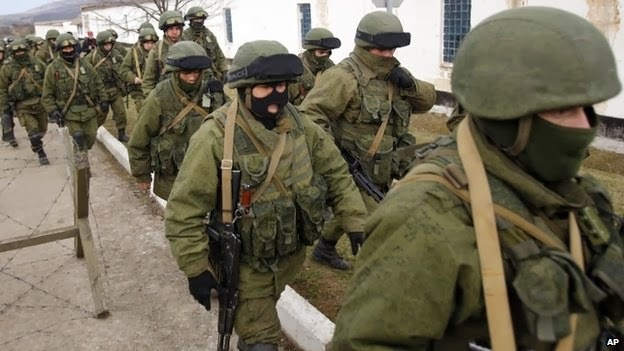 The US now says there are more than 6,000 Russian troops occupying Crimea. It's been suggested he has a problem of credibility, and that has encouraged Putin. Certainly the West seems ill-prepared for this escalation of the crisis, which they should have seen coming - as I wrote when the protests were at their height. It was obvious Putin would not give up easily. But you can overdo the Obama factor. It's worth remembering that Putin went to war in Georgia when George W Bush was in the Oval office, and no one thought he was a peacenik. But Bush obviously thought better of fighting another nuclear power over a former part of the Soviet empire. Senior administration officials have reacted furiously to the suggestion that Obama's past behaviour has encouraged Putin. They say the Russian leader's policy in Ukraine has failed; he has no game, and all he has left is the use of hard power. They say the world should be blaming him, not Obama. We are going to see a lot more moves over the coming days, with the US trying to co-ordinate an international squeeze on Russia. The first point of pressure is the June meeting of the G8 in Sochi. The US, Canada and the UK have cancelled meetings preparing for it. The "off ramp" - the offer to help Russia back down - is a plan to send international monitors to make sure ethnic Russians are safe. This is hardly going to appeal to Putin. It is worth remembering that Crimea was a part of Russia from 1783 onwards and in the early years of the Soviet Union it was an autonomous republic within the Russian Federation. Khrushchev gifted it to Ukraine in 1954. Now Putin wants it back. To withdraw would be a failure and a humiliation for him.The problem for Obama is that an economic squeeze takes a long time to work. Putin may not mind the diplomatic pressure at all - he seems to enjoy tweaking the noses of Western leaders. It is easy to see how the situation could get very much worse - and it is not clear how Obama would react to a deepening of the crisis.